In an effort to "get in front of the story," as they say in the spin business, I would rather you hear/see this from me, instead of reading it in the mainstream press. I did what I did, and I don't feel at all badly about it. I feel oddly liberated. At the Dressner tasting yesterday I experienced a shockingly clear example of the role that soil plays in shaping wine. Opening several wines at a time is the best way for a guy like me, who is in the middle of building his tasting memory, to get a good sense of the differences that soil can bring. Most of the wine I drink is at home with dinner, and we don't often open several wines just for the sake of comparison. When I win the lottery, we'll do so regularly, and this blog will be all the better for it. That's why this experience at the Dressner tasting was so interesting for me. I've had François Pinon's wines before at home, and I've had them at tastings too, but they were just profound yesterday, really singing their own songs. These are two Vouvrays that could not be more different from one another, although the vineyards are within a couple of kilometers from each other and they were vinified in exactly the same way. The 2007 Vouvray Cuvée Tradition is from clay soils and the wine is rich and round with a ripe honeyed fruit character, expansive and broad. There is good acidity and structure, but this is a wine that is driven by voluptuous fruit, and it is clean and delicious. The 2007 Vouvray Silex Noir is from soils of rocky black flint, and the wine is much leaner, with a racy mineral character that drives through the finish. There is lovely fruit here too, but it is of a more refined nature. It is also quite ripe, ripe enough so that there is a honeyed glow to the intense mineral mid-palate, but the essence of this wine to me is the cutting rocky minerality. It is a balanced and beautiful wine, and at about $24 retail, a terrific value in my opinion. Both wines are technically demi-secs, or off-dry wines, with 18 grams of residual sugar in the Tradition and 17 in the Silex Noir (the limit is 9 grams in order to be labeled as a sec, or dry wine). But the Tradition feels and tastes like a demi-sec, whereas the Silex Noir feels and tastes like a dry wine that has a honeyed edge. I asked François Pinon, who like almost all of the producers represented at this very fine tasting, was right there pouring and discussing his wines, how these two wines can be so completely different from one another. He said, simply, "If I describe these soils to you, I could be describing the wines. Silex is filled with sharp black rocks, and the other with deep soft clay." And there you have it - in 2007, François Pinon has definitely figured out how to make the earth speak. And as an aside, although both are great wines, I preferred the Silex Noir, and Pinon says that his wines in 2007 will age gracefully for a long time. I think this one is a good candidate for my daughter's birth-year case. I have no statement of ethics anywhere on my blog, but I'm going to add one today. What spurred this? Probably the biggest thing is the dust-up on Dr. Vino's site. Doc, as I affectionately call him, wrote a series of posts attacking Robert Parker and his employees. Doc is questioning their professionalism and ethics based on a damning email exchange and on what he says is a violation of Parker's published ethics policy. You already know about this, because the only person who reads my blog but does not also read Dr. Vino's blog is my father-in-law. And he probably reads Dr. Vino too. If I do not know something, I say so. When I write about a wine or a wine-related topic (any topic, really), I first check around the blogosphere to see whether or not anyone else has already written about the same thing. If they have, and if my post will say some of the same things, I indicate this in my post and link to the other post. In other words - I try to give credit to others who wrote before me. I never quote people anonymously - no "unnamed sources." If they won't go on the record, then I don't use the quote. I don't write negative reviews about wine or restaurants unless I have enough context to be super-confident in my views. When I write about a wine I tell you where i drank it - I never talk about a wine as if I drank it at home, when in reality I tried a sip of it at a trade tasting. I don't write good reviews as a function of being friendly with people. I never let personal relationships play a role in recommending something. I happily accept samples, as long as the sender agrees to my samples policy: "you can send it, I promise to drink it thoughtfully, but I may or may not write about it, and if I do write about it, I write whatever I want to write." If I do write about the wine, I say that it's a sample. I happily accept freebies, if they appeal to me, using the same policy regarding samples. I write or do not write about it as I please. I want to offer a few examples regarding samples and freebies. I've received my fair share of samples in the past two years and I've written about exactly one of them, the 2000 Movia Puro Rose that I reviewed for a Friday Night Bubbles post last summer. When I wrote about it I indicated that the wine was a sample. And by the way, I wasn't crazy about it. I wrote about it because it is fascinating wine. Why is that the only sample I've written about? I don't write bad things about wine unless I feel that I have enough context to do so, and most of the samples I receive are wines that I rarely drink. I get wines from Washington State, Chile, Australia, New York (a load of them this winter) and more. I don't write about them because I rarely like them, and if I do like a wine, I haven't had anything interesting to say about it. If all I have to say is "I don't like that wine," or "I got a Cabernet Sauvignon from Long Island as a sample, and it was pretty darn good," I'm not going to waste your time with that. I try to make it more interesting around here (not always succeeding, I know). I've never asked for, nor have I received a sample from Dressner, Jenny & François, Chambers Street Wines, or any of the retail stores, importers, or distributors whose wines I drink and regularly write about. Actually, Joe Dressner gave me a bottle of wine once, a 2000 Clos Rougeard Saumur Brézé. I was hosting a wine dinner and I asked him where I could purchase a dry Chenin Blanc with some age on it, and he generously offered this wine as a gift. When I wrote about the wine, I indicated that it was a gift. I wish that importers/distributors would actually take a quick look at my blog, and then if they are inclined to send samples, send something that makes sense. Something that might fit in with the rest of the wine I drink. If I were an importer and I saw Brooklynguy's blog, I might say "I'm sending this guy my Beaujolais, my Sancerre, and my Provence red." Or "I'm sending this guy my California Roussanne that I think he'll find interesting, based on the other wines he likes." This, my friends, is clearly fanciful thinking on my part. More on freebies - what is a freebie? A trade tasting is not a freebie because everyone is invited. A freebie is something I'm invited to do that some one else pays for, and where I am the, or part of the target. I sadly have not had to worry much about this, as I get few of them (so far, but I have my fingers crossed). But I've had some good ones: the lunch at Grammercy Tavern sponsored by the Portuguese Trade Commission, my recent dinner with Savio Soares, the tasting of 12 year old Long Island wines, to name the ones I can remember right now. In some cases I wrote good things about the wines, in others, not so good. But I am not so weak-kneed and without integrity as to write favorable reviews simply because some one takes care of lunch or dinner. That said, the one biggest ethical lapse I've had on the blog thus far, I would say, is that I didn't make it clear enough in the Savio Soares post that he sponsored the whole thing. In the end, here is the thing: you are an important part of this too, reader. You are responsible for determining whether or not my reviews are meaningful to you, or Dr. Vino's, or Robert Parker's, or anyone else's. If you are reading for entertainment purposes, then please enjoy yourself. But if you make purchasing decisions based on what a writer recommends, it is your responsibility to determine whether or not you agree with that writer, and whether or not you would take their advice a second or a third time. Not to say that Parker and others should act unethically, but since we can never know with certainty what really goes on in the house of Parker, Dr. Vino, or Brooklynguy, it is merely good sense for a consumer to think critically about what they read. I think that you have everything you need in order to do that with reference to my blog. If I am wrong, I sincerely hope that you will tell me so. Not so we can have an argument, but so I can learn from what you're saying, and make whatever changes may be necessary. Please ask questions, challenge me on this, offer your opinions, chime in however you see fit. 2006 Domaine Oudin Chablis Les Serres, $22, Jenny & François Selections. Christiane Oudin and her husband Jean-Claude took over her father's small 2 hectare estate in Chichée, very close to the town of Chablis, in 1988. Christiane's father did not bottle his own wine, instead selling his grapes to the négoce, and his farming methods were quite far from organic - perhaps guaranteeing a full harvest and supporting his family were more important to him than organics and biodynamics. The nerve on him! Christiane and Jean-Claude preferred a more natural farming philosophy, and now their daughter Nathalie continues in that direction. The family has acquired more land since 1988 - there are now 8 hectares, including small parcels in two 1er Cru vineyards, Vaugiraut (.75 hectare) and Vaucopins (.40 hectare), the latter of which is not imported to the US. There is also a basic Chablis which is not imported to New York, although it does go to other states. I emailed Jenny Lefcourt to ask about Les Serres and she said that it means greenhouse, so perhaps that plot of vines is in a warmer spot than the other village-level Chablis holdings, only the best of which also make it into Les Serres. The wine is fermented in tank without added yeasts, and aged in tank also, spending 2 years on its lees. This extended lees-aging gives the wine a rich and creamy nuance that acts as a counterpoint to the vivid acidity and the sharp minerality of the wine. The 2006 is a beautiful wine, an attention grabber. Not because it is super concentrated or brimming with fruit or anything like that, but because it is so perfectly balanced. 2006 was a warm year in Chablis and I've had several wines that are flabbier than usual. This wine is razor sharp though, with a lithe muscular frame that right now in youth is coiled with potential energy. The fruit is perfectly ripe - not at all overdone, and there is great acidity. The wine feels supple in the mouth, and there are typical Chardonnay characteristics of citrus and orchard fruit, but this wine is absolutely and unmistakably Chablis, with prominent seashell and iodine notes, and almost punishing minerality. White flowers drift in and out, waves of fruit pass through, but the Chablis core is steady, and the wine is completely and exuberantly delicious. It's utterly drinkable now, but it seems well structured enough to cellar well for up to 5 years, although that will be genuinely difficult to accomplish unless I put what I have left under lock and key, and lose the key. It is almost cliché to say that Burgundy is a crap shoot, every bottle a roll of the dice. But that's because it's true. Price and quality can have a rather distant relationship, and there can be great variations in climate just within one village. Which part of Volnay was hit by hail in 2001? Better check on that before spending $75 on a Lafarge Clos du Château des Ducs. Was it northern or southern Vosne-Romanée that got heavy rain and then a lot of rot in 2006? Best to find out before spending your $80 on Hudelot-Noëllat's Malconsorts - maybe Les Suchots should be better. If you're into Burgundy, you know I'm not kidding or exaggerating. Malconsorts and Suchots are within a stone's throw of one another (if a major league ball player were throwing the stone), but they will always produce different wines - and that's a terroir issue. I'm talking about weather problems like hail or heavy rain or some other climatic stress, when a producer makes adjustments in the vineyards and sometimes in the cellar, and makes the best wines they can. But when the best they can is merely decent or average wine, (or very good wine that you got a bad bottle of), it's still Lafarge Clos du Château des Ducs or Hudelot-Noëllat Les Suchots, and it still costs $75. For folks like me who buy two or three bottles per year at that price, it's a matter of risk reduction. I choose solid producers, and then wines from vineyards that interest me and that are not mentioned in bad weather reports. I do exactly the same thing when buying Burgundy wine in the $20-40 zone, the range that I tend to live in. And it's just as much of a guessing game in the end. Lauded vintages don't always translate to great wines, and so on. Why do I keep doing it, although I feel like I "waste" more money on Burgundy that I do anywhere else? Because I fell so hard for the exquisite wines I've drank, that I continue to chase that feeling. And you never know where you'll find that feeling - a $25 bottle of Bourgogne can be exquisite. 2001 Philippe Pacalet Pommard, $45. I bought two bottles because I served this wine to friends during their birthday dinner. On that night it seemed a bit tired and lifeless. We didn't need the 2nd bottle that evening, and opened it a month later without expectations. It was absolutely delicious - zesty and fresh with beautifully clean fruit, and with almost completely resolved tannins that made the whole thing feel luxurious and soft. But I spent $90 on these two bottles, and only one of them was worth it. 2004 Hudelot-Noëllat Vosne-Romanée 1er Cru Les Beaux Monts, $43. When we opened it it seemed like it was going to be utterly gorgeous, an explosion of vibrant dark fruit and earthy spice. But it was all downhill from there with a dilute mid-palate, and after two hours open it was marred by a distinct ashtray type of smell that rendered it essentially undrinkable to me. This wine suffered from a case of under-ripe tannins, and no amount of cellaring can fix that. By the way, my friend whose house I brought this wine to really liked it, and he has a great palate, so what do I know. 2002 Domaine René Engel Vosne-Romanée, $28. Yes, laugh with me at that price. It's essentially impossible to find any village Vosne wine these days for under $40. 2002 is supposed to be such a great year, and this is a good producer (although that reputation grew under a different wine maker). Pleasant dark fruit and soil aromas, a bit of volatile acidity that blows off quickly, some underbrush shows with air. Pleasant and tasty wine, but not complex, and the simplicity becomes a distraction for me. For whatever it's worth, I'm not sure that there is much of a Vosne stamp either. 2005 Lafouge Auxey-Duresses 1er Cru Les Duresses, $27. I liked this wine when it was first released and full of dried leaves. Now the fruit is more prominent, and it's even better. There is still underbrush and some lovely spice too. Great wine, and makes me excited for the other 1er Crus from Lafouge that are sleeping in my cellar. 2005 Domaine des Croix Bourgogne, $25. I loved this wine when I drank it a year ago, but this time it was dominated by wood. And I wonder, can this much wood really integrate? Some would say it can, but I am reminded of something that Jeremy Seysses of Domaine Dujac said in December when leading us through his 2007's in barrel - he thinks that ripe vintages do not take to wood as well as other vintages, that the oak integrates better in the long term in a vintage like 2006 over 2005. If I'm misrepresenting what he said, hopefully Peter or Tista will read this and correct me. 2005 Catherine et Claude Maréchal Bourgogne Cuvée Gravel, $25. I am a fan of this producer, but this wine was simply too ripe. It came across as sweet and out of balance, with awfully prominent alcohol considering the 13% on the label. The 2007 is beautiful and balanced, a wine of grace and interest, and it's the same price. 2005 René LeClerc Bourgogne, $25. Needs a decant or just time for the carbon dioxide to find its way out of the wine. Very pure and good intensity of fruit, and shows an orange zest earthiness that for me is very Gevrey-Chambertin. A very lovely wine. Why is this 2005 Bourgogne lovely and the above two not as lovely, my personal taste aside? Leclerc's Bourgogne vines are in Gevrey somewhere, and perhaps they experienced more favorable climate than the Savigny-based vines of Maréchal or the Beaune and Pommard based vines of Des Croix. 2006 René LeClerc Bourgogne, $19. Drinkable, but not a successful wine. The aromatic profile is heavy with underbrush, and the fruit never really asserts itself. The palate is light bodied and rustic - a bit muddy almost. 2004 Dureuil-Janthial Rully Maizières, $18. 2004 was a difficult vintage for reds that deservedly has a mediocre reputation, and although the region's wines have been improving, the Côte Chalonnaise as a whole is not particularly distinguished terroir. I took a shot on this wine because the producer is one of the best in the Côte Chalonnaise, and because the price seemed reasonable. And it of course defied all expectations and was completely delicious with bright fruit, nice acidity, a bit of earthiness, and fully resolved tannins. Had I only known, I would have bought two bottles instead of the Hudelot-Noëllat and still saved a couple of bucks. If you can truly figure out this whole Burgundy thing, then more power to you. NV Champagne Raymond Boulard Petraea XCVII - MMIII, $38, Imported by Selected Estates of Europe. Thank goodness that wine is not priced strictly according to quality (or my sense of it, anyway). If it were, Boulard's Petraea would cost far more than $38. Think of all of the insipid Champagne out there that costs way more than $38. I prefer this to any other Champagne of equal price that I've tasted, and it's better than many vintage wines that cost twice as much money. And I'm not even crazy about this particular version of the wine! Raymond Boulard's wines (now made by Francis Boulard) are a truly fantastic value in Champagne. The Boulard estate is located in Cauroy-lès-Hermonville, even further north than Chartogne-Taillet in the Montagne de Reims. It would not be unfair to say that Boulard is in the middle of nowhere. Just goes to show that skill and dedication in the vineyards and winery are every bit as important as prime real estate when it comes to making great wine. Petraea is an unusual wine made in a “perpetual cuvée” (a term that Boulard prefers to “solera”), begun in 1997. The name Petraea refers to the type of oak that the barrels used for this wine are made from, and the final blend contains about 60 percent pinot noir, with the remainder equally divided between chardonnay and meunier. It’s neither filtered nor fined, and it’s bottled at a slightly lower pressure (five bars rather than six), “due to its vinous character,” says Boulard. I drank Petraea XCVII - MMII last summer and loved it, as I have loved every Boulard wine I've tried so far. And so I decided not to be frightened by MMIII, even though it features grapes from the roasting-hot 2003 vintage. But as usual, only 25% of the current vintage's grapes are blended in Petraea, the balance being a blend of wines from 1997 through, in this case, 2002. MMIII most definitely showed the hot muscle-car character of 2003, although it retained it's elegant side too. It is not as good as MMII, and I imagine that it is not as good as MMIV, which I have not tasted. But it is very good wine, with a broad and rich marzipan fragrance and a deliciously juicy palate that remains mostly in control, with ripe fruit, rhubarb, more marzipan, and decent acidity. This is not an elegant wine, but it has a mature and refined character on the nose, and although the palate feels overly exuberant at times, it is always tasty and a pleasure to drink. Perhaps not a wine to go deep on in the cellar, but without question a wine to buy if you see it, and one to enjoy in the next few years. This is a wine that I think would pair well with the boldest of foods in unorthodox ways. I'm thinking...wait for it...herbed roast leg of lamb. Lamb and white bean soup with grilled buttered bread. Lamb, at a minimum. "This was one of those wines that make you realize why you spend 2/3 of your waking time thinking, reading and writing about wine, as well as drinking it." - Sharon Bowman, in her post about the 1985 López de Heredia Rioja Rosado Viña Tondonia Gran Riserva. That resonated with me when I first read it several weeks ago. Every so often we are lucky enough to drink a wine that provokes that sort of sentiment, a wine that dominates our thinking for a while, a wine to obsess over. This can be something of a curse too, if the wine is unavailable, or priced high enough so that my wife would kill me if I were to buy it. I've been obsessing about several wines for the past few weeks since I drank them at the Polaner tasting. I know, that sounds like a contradiction - you don't really get to drink a wine at an industry tasting, it's one of many that you quickly taste, and then move on. But these wines I actually did drink. All of the López de Heredia wines were very good, but the 1985 Rioja Rosado Viña Tondonia Gran Riserva, the very wine Sharon spoke of, was just drop dead gorgeous. Such an incredible perfume - roses, the softest and most well-worn leather belt, raspberries, so fresh and pure and youthful at 24 years old. This wine ended the tasting for me. I begged for a half glass and the woman pouring the wines took pity on me and said "Yes, I want people to drink my wines." I took my small glass of this amazing wine, found a table off in a corner of the room and spent the next 15 minutes savoring it. I can't stop thinking about this wine! The next time I have $90 burning a hole in my pocket, a bottle of this wine comes home with me. Earlier at the same tasting I drank a wine that Peter Liem has written about, a very special Sherry made by Equipo Navazos. This is an unfiltered fino Sherry and like the other La Bota Sherries, it is a special selection of the finest wines from the finest barrels in an old solera. In this post Peter discusses Equipo Navazos a bit further and describes why what they're doing is so unusual and special. I was thrilled to see a La Bota table at the Polaner tasting, and the wines were just sitting there - no one was tasting them. I spent almost a half hour there, tasting and "re-tasting" the absolutely beautiful La Bota de Fino #15 Macharnudo Alto. Impossibly fresh and pure, the cleanest and most incisive flavors, so brisk and refreshing, and astoundingly deep, all in one package. The La Bota de Amontillado #9 Jerez was also wonderful, but in a totally different way. Burnished amber and incredibly rich, like an intense chestnut honey, this wine was so intense that it made it difficult to taste or smell anything after drinking it, and I would prefer it at the end of an epic meal. Tasting it there in that crowded room felt out of place, it was too intimate of a wine for that setting. But the #15...my goodness! I ran into a friend and insisted that he taste it with me, which necessitated a "re-re-taste" on my part. The great thing is that this wine, what is perhaps the finest example of fino Sherry on the market today, can be had for $40. I bought a bottle and now have to stop myself several times every day from opening it. In March and April, and then again in November and December the fishmonger at my local farmer's market has herring. For years I stared at the tan and silvery fillets without buying. Then I got into pickling. Last year at this time I first tried my hand at pickled herring, and now I'm hooked. The fish are cheap, incredibly healthy, and very tasty when pickled. Rinse herring fillets (half pound), pat dry, and cut in half on an angle. Bring to a boil 3/4 cup of white vinegar and 1/2 cup water with 2 1/2 tablespoons kosher salt and 2 1/2 tablespoons sugar; 6 juniper berries, 6 black pepper corns, and 1 bay leaf. Boil rapidly for 1 minute, pour brine into a non-reactive bowl to cool. Allow to come to room temperature (I speed this by placing the bowl into a larger bowl filled with cold water). While brine is cooling, put something jazzy on the stereo - I'm recommending Monk's Dream or Lee Morgan's Sidewinder, but it's your call. Slice a white onion very thinly and layer some of the slices at the bottom of a glass jar, then a slice of lemon, then cover with a layer of herring. Repeat. When brine is cool, remove the bay leaf, snap fingers to the music and pour into the jar. Cover tightly, put in the fridge, and forget about it for a few days. Here's an important question - what wine do you drink with pickled herring? The Swedes pair with Akvavit. My Jewish ancestors I'm guessing paired mostly with Metamucil. Typical seafood wines like Muscadet or Chablis just seem wrong. Too much acid, and the flavors would grate on each other. Poulsard? Now there's a thought. But maybe that's just because I'm so nuts for Poulsard now that I'd drink it with a peanut butter and jelly sandwich. A Blanc de Blancs Champagne? It would be overwhelmed. I think that this is one of the true wine pairing conundrums - what wine would taste good with pickled herring? The other day I hit it, when there was merely one serving left in my jar, which I enjoyed tremendously as a late lunch. Ready for this? Any last guesses before I reveal? Fino or Manzanilla Sherry. There it is, and it works beautifully. The flavors are bold enough not to be overwhelmed, and briny enough to work with the fish. The oxidized nature of the wine somehow works with the pickle. Who can explain these things, really? Trust me, try it, even if you have to wait until November. 1998 López de Heredia Rioja Rosado Viña Tondonia Gran Riserva, $27, Polaner Selections. Spring is in the air and there's no denying it - even the sourest New Yorker is ready to smile. Recession? Depression? Fugedaboudit. Magnolias are blooming and my 3 month old daughter seems to have inherited my green eyes. BrooklynLady and I began what is now our tradition, to open a bottle of this beautiful old rosé from Rioja at the beginning of the springtime. This is no ordinary rosé, by the way. This wine, like all of López de Heredia's Gran Riservas, is aged in oak and is released only when Maria and the other members of the López de Heredia clan feel that it is ready to drink. It is made only in better vintages, and it brings with it the ancient marine mineral bed that is the Tondonia vineyard. You can drink all sorts of Rioja, and then drink López de Heredia, and it's as though you're in outer space, it's so different from everything else. Not overly extracted or concentrated, not vanilla oak flavored, not masked by anything at all, these are some of the last wines that truly speak of the place that is Rioja. The blend is the same every time this wine is made - it is mostly Grenache at 60%, and the balance is Viura (20%), and Tempranillo (20%). The 1998 is more tropical on the nose than the '97 or the '95, with prominent aromas of coconut and tangerine. It is an airy and fresh nose, although the wine is oxidized to the point that it also shows distinct sherry-like notes. A strange and lovely contradiction. With a bit of air, a level of minerals emerges, as if you've been sinking slowly in seawater and suddenly come to rest on a bed of old coral. On the palate this shows far greater structure than I expected, as the wine is so spread out on the nose. The acidity is vibrant and the wine is perfectly balanced. The flavors are bold and clean, and quite complex, with fresh oranges and even a hint of pineapple, infused throughout with minerals, and with a sherry-like buzz underneath. This is just delicious wine, one of the most rewarding rosés available. I'm not sure of the classic pairings for this wine. Jamón Ibérico? Grilled shrimp with garlic and butter? The '97 was more of a crab and shrimp wine (and I prefer it to the '98, but that's about style, not quality), whereas this wine, the '98 is more tropical. We loved it with our Sephardic roast chicken, rubbed with pimenton, cinnamon, and allspice, and stuffed with pistachios, apricots, almonds, orange rind, and sherry. Maybe it just doesn't matter. With wine this good, the food just falls into step. If you're curious (or masochistic, perhaps), here are the posts on our previous experiences with López de Heredia rosé: the 1997 last May, and the 1995 in spring two years ago. "I drank a few of your wines recently and I really like them. I want to try more of them - are you having a spring tasting?" I asked Ariel, Savio Soares' wine rep. "Not that I know of," she said, "but I have another idea. Let me get back to you." And that is how I found myself on a recent Sunday evening, along with Alice Feiring, sitting with Savio Soares at Il Buco. Savio strongly feels that the best way to understand his wines is to enjoy them with friends over a meal, so he created this opportunity for Alice and me - a very lovely gesture. And because he used to be the General Manager of the restaurant and in charge of the wine program, we received what you might call special attention. Maybe this is every day stuff for you, but I have a 3 month old and a 2 year old and I don't get out much. And this is a recession - my work world is slowly shrinking. I don't get to do this very often - enjoy a lavish meal and 10 wines at one of the city's better restaurants. I had a blast. "Don't assess on the first sip. Coat your palate with this wine, take your time, take another sip, and then you will understand the wine. "- Savio Soares, as I sipped my Riesling. That pretty much sums up Savio's attitude in general. Make time to smell the roses. Don't rush to judge a wine, because the good ones take time to unfold in the glass. And I think he has successfully knit this attitude into the fabric of his everyday life. He lives in Krefeld, Germany, his wife's hometown. He spends a lot of time with his son, now 7 years old (and he was the primary caregiver when his son was an infant and his wife had a "regular" day job). He travels frequently and greatly enjoys his work with a small group of wine makers, mostly in Germany, France, and Austria. He is a man who is perpetually smiling, and genuinely. He seems like he is truly at peace, and that, my friends, is a nice thing to be around. I like elegant wines: harmony, silkiness, acidic structure, aromatic finesse, all that I find very important. Personally I really like high levels of acid in my wine and find that this is one of the most important elements to bring elegance to a wine and the one that also makes drinking and enjoying wine, a fun thing to do. For the same reasons I like wines from cold climates, longer ripening seasons and also wines that are made in the traditional style of its region and reflects it. Above all, for me to import a wine, I must like and respect the winemaker and 99% of the winemakers I work with have no secretaries. Everything in regards to our collaboration is treated directly with the winemaker or his wife/husband. I only work with family-run wineries with an average size of 7 HA. These winemakers do care about the wine they produce and after sometime working and enjoying wines like these, one notices that these wines are imbued not just with traces of its region but also with the energy of care and respect that was dedicated to it in the vineyard and in the cellar. Savio Soares' wines as a group are cut from the same cloth as Joe and Denyse Dressner's and Jenny & François'. They are "real" wines, wines that showcase purity of fruit and do as little as possible to mask the place they come from. They are energetic and lively, and they are meant to be enjoyed with food. They are competitively priced too, which is a nice thing. One of my favorite dishes of the evening was the very first, bruschette topped with sea urchin, arugula, capers, and lemon. The ultra-clean briny sweetness of the little sea urchin half-moons played beautifully off the bitter arugula and the sour lemon. I would happily eat that dish every day for the next 5 months. And I thought the 2007 Ernst Clusserath Trittenheimer Apotheke Riesling Kabinett Trocken (about $30) was a great pairing. The round and rich nose of the wine belied its bone dry bitter fruit pit flavors. Like the sea urchin, the wine was clear as a bell. The 2005 Reynald Héaulé Vin de Table L'Insoumis de Village, or 'Black Sheep of the Village' (about $30) is a serious country wine made by one of the new wave Loire Valley natural wine hipsters. This wine is Cabernet Franc, Pinot Meunier (yes, you read that right), and a third mystery grape which the producer will not reveal. This wine had a wild leafy peppery streak. Alice loved this one, and she was already quite familiar with the producer. It reminded me of Pineau D'Aunis, but richer, and it paired beautifully with the olive oil poached octopus with chick peas. The 2006 Philippe Bornard Trousseau Le Ginglet Arbois Pupillin (about $25) was redolent of red berries and cinnamon. "Typical of wines made in the Jules Chauvet method," Alice said. I loved this wine, with it's wild intensity and it's leafy herbal character. It went beautifully with gnocchi, and not the typically dense dough balls that pass for gnocchi. These were feathery pillows of deliciousness, accompanied by Brussels sprouts and walnuts for a subtle flavor combination that really accentuated the texture and flavor of the gnocchi. I've seen these Bornard wines around a lot lately, and I want to try the Poulsard next - I've been really digging Poulsard lately. The 2005 Wilfred Rousse Chinon Les Puys (about $20) was, to me, a classic. Ripe fruit (this is 05, after all) iron and salt, and eminently drinkable. 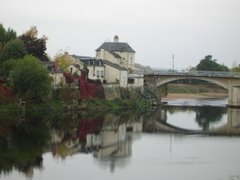 It should retail at about $20 and it's a great new discovery in Chinon. It was delicious with our roast quail. As was the 2007 Avanti Popolo Les Temps des Cerises (about $25). This wine is a full bodied mouthful of old vine Carignan from the Languedoc, but is is also quite graceful, and the acidity keeps the wine feeling lively. This comes from vines high up on the hillsides, Savio explains, and the grapes are cooled by evening breezes. Perhaps the most memorable wine for me was the final wine of the night, a sweet wine, a rosé of Pinot Noir. The 1994 Geschwister Ehrhard Rudesheimer Berg Rosenach Spätburgunder Beerenauslese (about $60 for 375 ml). This wine was luscious and primary in its beautiful fruit, with soaring and penetrating acidity. I've never had anything like it before, and it was just a fantastic experience to drink. Right now Savio's wines are distributed only in New York and New Jersey, so if you're in the area, keep you eyes open for them. Hopefully they'll make it to the rest of the country soon. Peter Liem is my good friend. Please don't let that compromise what I'm about to say about his new Champagne website. I'm an honest guy and I would never recommend something here without fully believing in it. Happily, I can write a rave review of ChampagneGuide.net without any conflict of interest, because the site is just excellent. It opens with nuanced aromas of clean organization and a feng-shui-esque sense of space. But don't let the spare grace fool you - this site crackles with vibrant energy. Information bursts forth, enveloping you in its erudite, yet accessible grasp. On the palate this site is a harmonious balance of background information and context, complex producer profiles, and vivid tasting notes. The overall effect is one that I am sure will improve as it ages gracefully - this is absolutely the finest online source of information about Champagne. Sorry - my little tasting note-as-review joke went on longer than I thought it would, but I was enjoying myself and that's the most important thing, isn't it? Okay, serious review now. ChampagneGuide.net is a great thing for anyone interested in wine. It offers detailed profiles of Champagne producers big and small. You'll find Veuve Clicquot and the other big houses, and you'll also find Henri Billiot and the other grower producers. There are at least 75 producer profiles on the site right now, and more will be added periodically. This site is based on understanding the producers, not on listing wines and scoring them. These are informative profiles that offer just the right amount of information. They describe the producer in terms of history, location, and technique, and then provide an overview of the wines and the experience of drinking them. 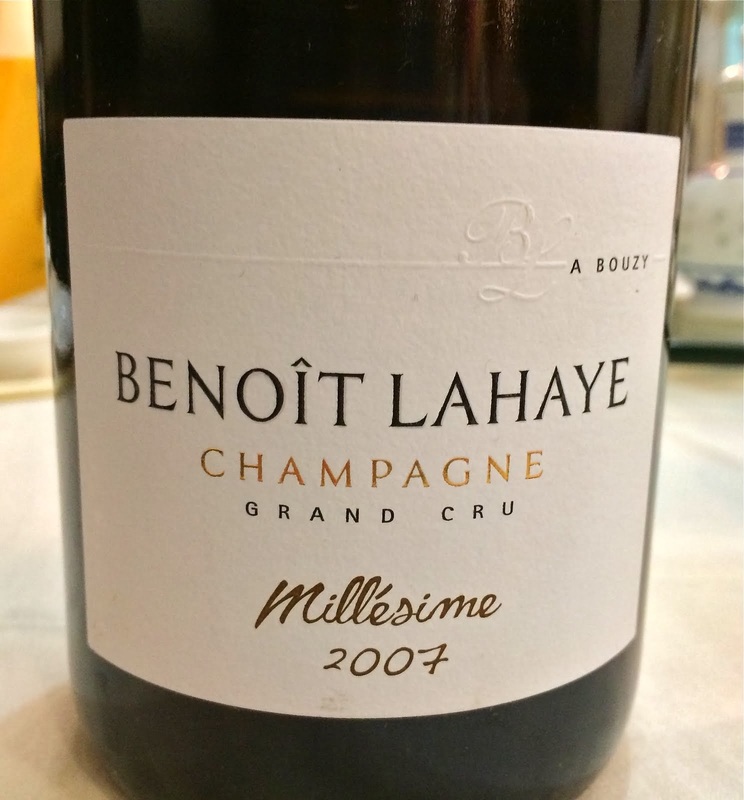 A profile takes no more than a few minutes to read, yet provides all of the information I want when thinking about Champagne producers, and whether or not I want to explore their wines. A list of current wines sits on the right sidebar of each producer's profile, and clicking on a wine brings you to a detailed tasting note and a rating of zero to three stars. Peter provides this sample page profiling Agrapart & Fils for curious visitors. So far I'm kind of addicted to reading through the producer profiles, looking through their current releases and imagining all of the things I'm going to buy and drink when we climb out of this recession. I've also enjoyed playing around with the only good map of Champagne that I can find on the web.This one pinpoints each producer so you can see who lives where. But one of my favorite things to do is to use the advanced search engine. You can search for wines based on their level of dosage, grape variety, the region they come from, the vintage, the type (Blanc de Blancs, Rosé, etc. ), their rating, and more. And you can combine searches. For example, you might say "show me all of the three star rated wines" (there are merely 20 out of hundreds of wines). Then you might say, "Show me all top rated Blanc de Blancs" (there are four). There are limitless ways to play with this, and since the site will be updated regularly with new content, the subscriber will always have access to the newest information about Champagne. This site is not free, although there are parts that anyone can view. A one year subscription costs $89. This is cheap, in my opinion, for what you're getting. Peter lives in Champagne and this site represents years worth of painstaking work learning about producers and their wines, and assembling this information in one easy space. And if you're interested in Champagne and you're not a rich person, this site will save you money, plain and simple. If you have $45 to spend on a special bottle, this site can help you figure out what should be the best value for your money, after you survey what's available in your area. If you are already somewhat well-versed in Champagne, the site is a simple and economical way to delve deeper, to get a sense of how to continue exploring. Go check out the site. It's easy to use and full of great information and writing. And yeah, I'm Peter's friend but I would have written this exact review had George W. Bush created ChampagneGuide.net. It really is that good. Okay, maybe not Bush, but Condoleezza Rice, let's say. 2007 Domaine Huet Vouvray Sec Clos du Bourg, $28, Robert Chadderdon Selections. I'm putting together a case of birth-year wine for my older daughter, who was born in 2007. I want to give her great wines, wines that will improve with 19 years of cellaring. I wish I had the financial means to fill this case with things like Dujac Clos de la Roche, Pierre Morey Meursault Perrieres, and other wines that are some of the world's finest versions of their type. Luckily there are affordable wines that also are the finest examples of their type. 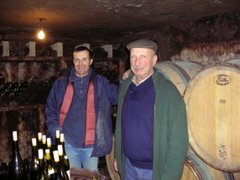 Noel Pinguet of Domaine Huet, along with Philippe Foreau, makes the best wines in Vouvray. Many people consider these to be the finest Chenin Blancs from the Loire Valley and in the world. I also love the Chenins of Montlouis and Savennieres, but I don't want to quibble - there is no question that the wines of Domaine Huet are among the very best Chenin Blancs in the world. And happily, I can afford to buy and drink them. 2007 is the current vintage on retail shelves and it's actually lower in price than the three previous vintages, perhaps reflecting the changing economic climate. 2007 was not an easy year in most of the Loire Valley, and Vouvray was not spared the rainy cool summer that dampened prospects for many growers all over the region. September was warm and dry, but there was some mildew and rot and yields were down in general. Some said that biodynamic, organic, and otherwise natural growers would have a particularly tough time in 2007 because of their reluctance to treat their vines against rot, but this seems not to be true, from what I've tasted so far. Great wine makers like Noel Pinguet make good wine in bad years, so it hasn't surprised me at all to read good things about the 2007's. But are these the kind of wines that will improve over 19 years? I decided to drink a bottle over the course of three days with BrooklynLady, and hopefully learn something about how this wine might evolve. Huet makes wine from three vineyards: Le Haut-Lieu, Le Mont, and Clos du Bourg, the latter in general is considered to produce the very finest and longest lived wines. In good vintages, several types of wine are made from each vineyard - sec, or dry wine, demi-sec, or off-dry wine, and moelleux, or sweet wine. These are wines of beautifully elegant fruit, great intensity and focus, and often times enamel stripping acidity that enables them to age for decades. For detailed information about the history, growing and vinification techniques, and tasting notes on the wines of Huet, here are two good web sources: Chris Kissack, the Wine Doctor, wrote a great profile of the estate, and Jim Budd of Jim's Loire wrote about his recent visit and offers all sorts of other information. Day 1 - Tight as a corset. So shy on the nose that it's difficult to tell what's going on. Apple fruit and lots of acid on the palate, something spicy a the core. With vigorous swirling, and three hours later, the wine is still impenetrable. Day 2 - Ahhh, this is more like it. More expressive on the nose, showing lots of rocky minerals, some wool, and hints of summer fruits. There is great intensity and focus on the palate, with a solid and still almost impenetrable core of energy at the center. But the wine is elegant and refined, very attractive. Day 3 - It has really come together now, with lovely quince and wax aromas, regal and mature. There are bitter herbs and citrus fruits underneath, and more rocky minerals. This is a wine of class and grace. The palate is just as intense as it was on the first day - will this wine ever die? There is great grip and length, and the sharp mineral cut stays with you after swallowing. At the Polaner tasting last week I spent some time at the Domaine Bernard Baudry table, tasting wine and hanging out with Bernard's son Matthieu. As Lyle Fass has already said, the wines were just fantastic across the board. So far I really like the 2007's in the Loire. They remind me of 2007 in Burgundy - the opposite of a blockbuster vintage. From the right hands the wines are crystal clear, totally unadorned. It was fascinating to taste Bernard Baudry's 2006 and 2007 Clos Guillot next to one another. Clos Guillot, by the way, is from young vines - about 15 years and younger. But it is a great site with clay and limestone soil and the wines are already excellent. As the vines become older, watch out! Maybe this is why Baudry vinifies this wine in much the same way that he vinifies his top wine, La Croix Boissée - fermentation in wood and aging in oak. The 2006 was a bit darker at the core and smelled of wild animals, musk, and leather. Fruit too, but deep dark and brambly. This is a wine that really needs food - something gamy. Or maybe cheese. The 2007 is a completely different wine. Bright and fresh with a core of vividly pure fruit, wrapped in lacy thin layers of spicy earth and minerals. I suppose I might eat something with this wine, but it would have to be something simple with subtle flavors, so as not to overpower the elegance and delicacy of the wine. I would happily drink it on its own. How can these wines be so absolutely different from one another? Were they vinified differently? Matthieu shrugs and says that they were made in essentially the same way. He says that 2007 was very difficult and yields were down at 32 hl/ha. That there were intense rains and mildew and September saved the vintage. 2006, he said was more generous. Yields were 45 hl/ha and the wines are bigger in structure and more deeply fruited. One might normally assume that lower yields means more concentrated fruit - better raw materials. But not if the lower yields are caused by rot and under-ripeness, as was the case in 2007. A reminder of the most important factor in wine making - climate. A reminder too of the old maxim: great wine makers make good wine in bad vintages.